There are some recipes that are perfect for emptying the vegetable crisper and this is one of them. 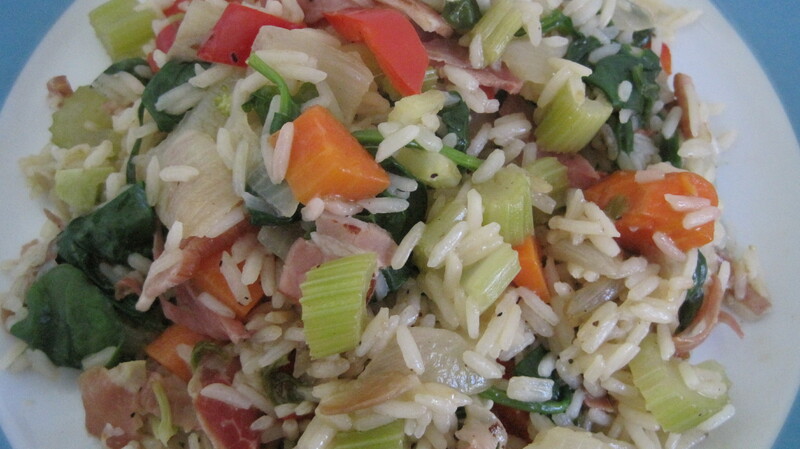 It is my own Australianized version of Hoppin’ John so apologies to purists. 1. Place the oil in a frypan and gently saute the onions until they are golden and transparent looking. 2. Now add the meat and fry until meat is cooked. 3. Now add vegetables and chilli and fry until they start to look a little tender. 4. Add rice and stir around until rice is coated then add lime juice then the water. 5. Place lid on top of pot and simmer until rice is cooked about 15-20 minutes. You will have to keep an eye on it towards the end. Keep moving it around with a wooden spoon. 6. Now add red capsicum and spinach and cook gently for another 5 minutes. Stir every now and then.